Get your hands dirty at Brave Harvest! We meet every Thursday 5:30pm-7:30pm. During weekly volunteer hours we work together to build, maintain, plant, and harvest the farm. You don't need to RSVP, just show up! Wear clothes you don't mind getting dirty, closed-toed shoes, and sunscreen, and bring a water bottle. We are now harvesting weekly, and we send volunteers home with extra produce! Brave Harvest is located at Curia on the Drag. Find the courtyard with the painted bus, and the garden is over the fence to the right. Salad is GREAT, from plant to plate! Join Brave Harvest at the Swallowtail Fall Festival for this growing, cooking and eating workshop for kids ages 4-12. We'll start out with a garden tour to see what's growing at Swallowtail Farm, then we'll harvest, wash, and prep our own farm salad. We'll even make a salad dressing! Parents are also welcome to join in on this 45 minute workshop. Come ready to try some awesome fresh veggies! Farm tours! Salad Dressing Contest! Info about future events! Indieflea! 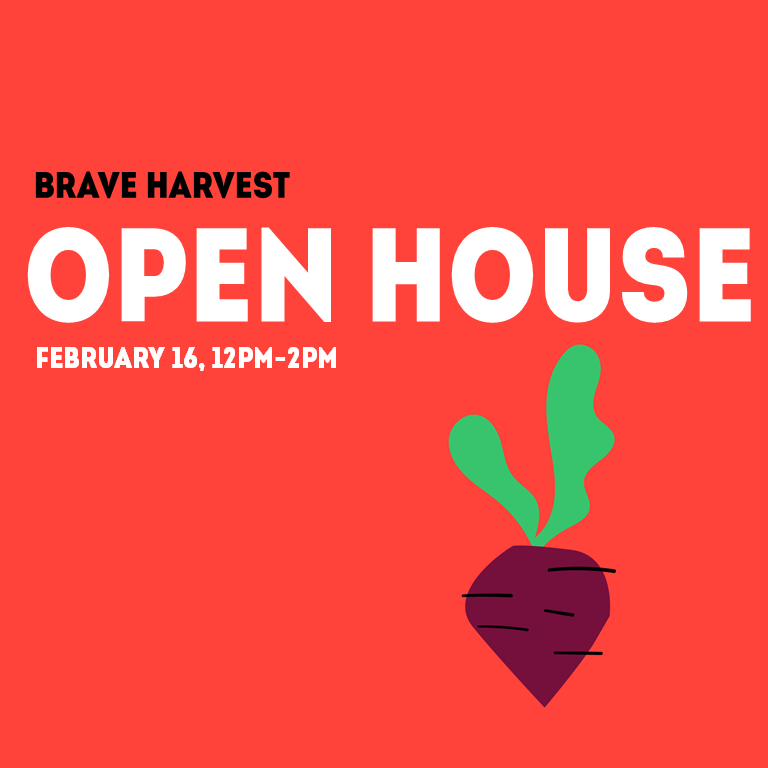 We’re inviting you and your family to visit us at our open house and we’ll be happy to answer gardening questions, show you what’s growing, and offer a taste of what fresh veggies can offer. We're also hosting our first salad dressing contest! Contestants bring a jar of their best homemade salad dressing, farm visitors decide which one is best, and the winner gets an 8-week Salad Box subscription, valued at $80. Register as a contestant here! We’ll also have a sign up for our upcoming Eat Your Plants Spring Break Camp. ALSO the Auk Market is hosting Indieflea this same day, with 40+ vendors and makers. Can’t wait to see you! Get your hands dirty at Brave Harvest! During weekly volunteer hours we work together to build, maintain, plant, and harvest the farm. You don't need to RSVP, just show up! Wear clothes you don't mind getting dirty, closed-toed shoes, and sunscreen, and bring a water bottle. We are now harvesting weekly, and we send volunteers home with extra produce! ACEL's Community Service Committee will be hosting a volunteer day at Brave Harvest on Saturday, August 18th from 9am to noon. We may be working with power tools (saws, drills), shoveling compost and mulch into beds, weeding, painting, and/or harvesting vegetables. Lunch will be provided, but other things to bring are listed below! Brave Harvest is a 501 (c) 3 non-profit organization whose mission is to empower and inspire kids to eat more vegetables through cooking and gardening. Brave Harvest is located at Curia on the Drag, where the organization maintains raised garden beds for the restaurant on site, and also has teaching beds where food is grown for donation. We are expanding our growing space to build four more beds for Brave Harvest. Shovel, pitchfork, wheelbarrow, power drills would be awesome!! This is your last chance before Christmas to pick up Brave Harvest hot sauce! Proceeds from sales fund youth cooking and gardening education at Brave Harvest. Stop by Gainesville Indie Flea to check out local craft vendors and get some shopping done! Brave Harvest will be at GLAM Craft Show selling hot sauce and t-shirts on Sunday December 3, 10am-4pm. Proceeds from sales fund youth cooking and gardening education at Brave Harvest! Take care of some holiday shopping with our booth and the dozens of other local vendors attending. See you then! Curious about what we've been up to for the past six months? Come visit us at our Open House! We'll be set up selling Brave Harvest Pepper Sauce and t-shirts at GV Pop Up Market at Curia on the Drag, and we'll lead 3 garden tours at 11:30, 12:30 and 1:30pm. Bring your little ones! We can't wait to meet you. Get your hands dirty at Brave Harvest! During weekly volunteer hours we work together to build, maintain, plant, and harvest the farm. You don't need to RSVP, just show up! Wear clothes you don't mind getting dirty, closed-toed shoes, and sunscreen, and bring a water bottle. Do you work during the week and can't make our Wednesday volunteer hours? Never fear! Come pitch in this Saturday. We work together to build, maintain, plant, and harvest the farm. You don't need to RSVP, just show up! Wear clothes you don't mind getting dirty, closed-toed shoes, and sunscreen, and bring a water bottle.